Boston, April 25, 2018, A total of 52 pieces of Chinese Brush Painting and Calligraphy were chosen as winners from a total of 195 entries (Brush Painting 148, Calligraphy 47). They were submitted by 16 different Chinese Schools, arts studios, and individuals from four states (CA, CT, MA, NJ). The images of the 52 winners’ art works will be posted on Foundation for Chinese Performing Arts’ website at: www.ChinesePerformingArts.net around June 10, 2018. Judges of the competition pose for a picture. 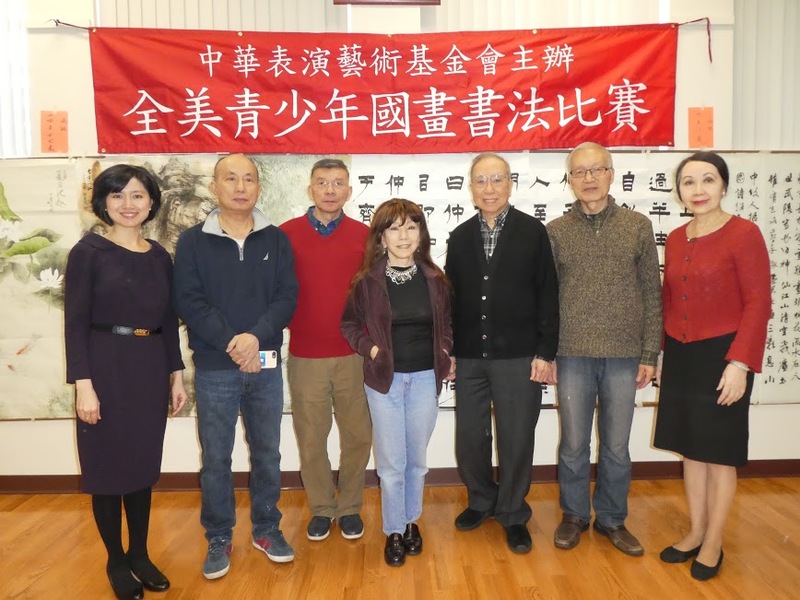 The 27th Annual US National Chinese Brush Painting and Calligraphy Competition is sponsored and organized by the Foundation for Chinese Performing Arts in April, 2018. Please find names of the finalists from each groups below. Their works were excellent. This project is funded in part by: “The Tan Family Culture Fund” and the donation from the general public. The names of the judges are listed at the end of this release. This competition will be repeated next year. The deadline for submission is April 15, 2019, and the jury date will be Saturday, April 27, 2019. 本項展覽即日起到5月1日為止。 52幅得獎作品經裝裱展出後，將在6月10日前後放上網頁 www.ChinesePerformingArts.net. 明年仍是同一時間舉行，希望大家踴躍參加。本項活動得到 「譚嶽泉蕭運貞文教紀念基金」及大家的捐款贊助。查詢請冾譚嘉陵, Email: Foundation@ChinesePerformingArts.net.